I wish to thank you for showing interest in FORE School of Management, New Delhi. We have been providing quality education in management for the past 27 years and over 5000 students have graduated from FORE since its inception in 1992. At FORE, students are expected to have an enriching and life-turning experience which will enable them to reach new heights in their professional life. We foster sharpening of skills and enhancement of knowledge base in our students through various extra-curricular, co-curricular and curricular activities through faculty who not only keep themselves at par with the current developments but also contribute to the expansion of the body of knowledge in their field of expertise. To facilitate this, we have Centers of Excellence to enhance domain specific research and training among members of faculty and entrepreneurship among students. With very congenial and professional environment our faculty makes substantial contribution to the academia through quality teaching, publications, seminars, conferences, etc. The faculty contribution has received recognition by way of various collaborations we have with our partner institutions and universities in India and abroad, and the excellent goodwill we enjoy with the corporate world who generously contribute to our various academic processes. The corporate interactions including corporate supported projects undertaken by our students under faculty supervision is considered ‘unique’, in the sense, that it provides a close hands-on-experience to our students as part of our curriculum. Further, to provide a flavor of global best practices, our students are exposed to a brief but intensive ‘International Immersion Programme’ at an international location, designed in collaboration with leading universities. Thus, as a student you certainly are expected to have an enriching and life turning experience that should propel you to take advantage of the new opportunities in life. As a prospective student, you are welcome to explore options that may be available to you in our various academic programmes and please do not hesitate to contact us for additional information. If you represent a business organization and are seeking any information on our students, our activities, etc., you are welcome to contact us and we will be too happy to explore initiatives of mutual interest. As a parent of a student, we assure you of a very enriching and fruitful time that your ward will be spending with us. And if you are a casual browser, please do let us know if you want any improvement in our website. Dr. Jitendra K. Das has avid interest in areas of developmental marketing, social marketing, environmental marketing, rural marketing, and application of quantitative techniques for developing robust marketing programs especially in the domain of Customer Relationship Management. Dr. Das has received numerous awards and honours. In January 2019, he received the ‘Certificate of Excellence’ and the ‘Educationist of the Year in Asia Award’ in the Asia Pacific Education and Technology Awards (APETA) & SUMMIT 2019 organised by ASSOCHAM India and The Education Post at Ahmedabad. In December 2017, he was felicitated as a “VISIONARY EDULEADER OF INDIA” by Sri Pranab Mukherjee, The Education President of India during Re:think India The Fifth Estate ‘National Convention of eduLEADERS & eduPRENEURS in HIGHER EDUCATION’ held in Delhi. In January 2017, he received the Award “One of Asia’s 50 Greatest Leaders 2016” in the Indo-Singapore Business Congress “Asia’s Greatest Brands & Leaders 2016” organized by AsiaOne Magazine & URS Media Consulting Pvt. Ltd. at Singapore. In December 2016, Dr. Das was honored with the ‘Certificate of Excellence’ and the ‘Educationist of the year in Asia for Revolutionary Contribution in Education Award’ in the Asia Pacific Education and Technology Summit & Awards (APETA) 2016 organised by ASSOCHAM India and The Education Post at Goa. In March 2016, he received ‘Transformational Leadership Award’ by ASSOCHAM India in the ‘LEADERSHIP Awards 2016’ at Patna. In January 2015, Dr. Das received ‘Jindal Global Business School-Top Rankers Excellence Award’ for ‘Institution Builder’ in the Best Academician Category at the 16th National Management Summit at New Delhi. In April 2014, he received ‘India Education Excellence Award’ for ‘Outstanding Contribution to Leadership Development’ by Worldwide Achievers and Headlines Today at New Delhi (about 80 institutional awards and only one individual award—to Dr J. K. Das—were given in this gala event). Further, Dr. Das was honored with the ‘BEST DIRECTOR AWARD’ in the Asian Education Leadership Awards 2013 held in September 2013 at Dubai. He was a recipient of the most coveted Connaught Fellowship for three years at the University of Toronto. He was empanelled on the ‘Distinguished Advisory Board’ of the 2007 INFORMS Marketing Science Conference held at the Singapore Management University, Lee Kong Chian School of Business, 28-30 June, 2007. He has widely presented papers to many national and international conferences/seminars. His contribution to the academia includes articles on systems analysis in natural resources and marketing that have appeared in national and international publications, such as, i) Proceedings of the International Symposium on Systems Analysis & Management Decisions-Monterey, University of California, Berkeley, ii) OR37 of UK Annual Conference, iii) Forest Policy and Economics (Elsevier Journal), iv) Ecology Society Economy: Life Sciences Dimension, Filander Verlag Press, Germany, v) Financial Express, vi) University, News, vii) Vikalpa – The Journal of Decision Makers (IIM Ahmedabad), viii) Business Research, ix) Marketing study reports to GWB, Germany, IDRC of Canada, and the World Bank, ix). Proceedings of National Seminars, etc. He has taught Customer Relationship Management, Advanced Marketing Research, Marketing Management, Internet Marketing, etc. courses at the Indian Institute of Management Lucknow (IIM Lucknow). He has also taught various courses at SP Jain Management Center, Singapore, IIM Kozhikode and IIM Ahmedabad. Besides, he has been associated with teaching at Danube Business School, Danube University Krems, Austria. 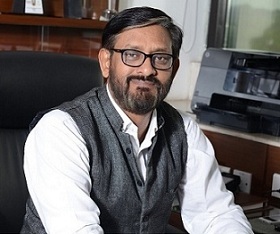 He was Professor of Marketing and Founder Dean (Noida Campus) at IIM Lucknow and has conducted many Executive Training Programs at IIM Lucknow including many one to five day programs at client locations. Before joining IIM, Lucknow, Dr. Das has worked with leading corporate organizations including Shriram Chemicals, Kota and WIPRO Information Technology Ltd. at Bangalore and New Delhi. He holds B.Tech. (Chemical Engineering) and M.Tech. (Management and Systems) degrees, both from the Indian Institute of Technology, Delhi (IIT Delhi), and a Ph.D. from the University of Toronto.